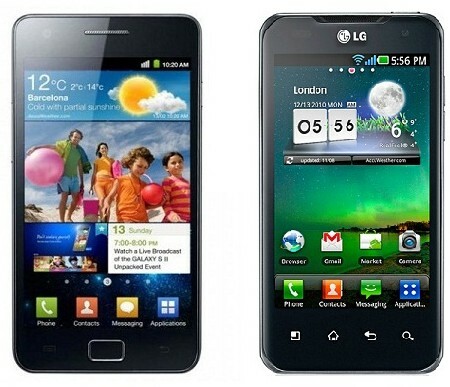 Samsung Galaxy S2 vs. LG Optimus 2X : Specifications and Price Fight! Based on the table above, we can conclude that Samsung Galaxy S2 pretty much slays the more affordable LG Optimus 2X when it comes to technical specs. The former is thinner and lighter yet has a bigger screen with perhaps better display quality, faster processor, better battery, higher Full HD recording frame rate, more sizable internal memory and even comes with Android 2.3 out of the box. The only thing that LG Optimus 2X has which Samsung Galaxy S2 does not is a built-in HDMI port - though users can get TV-out on Samsung Galaxy S2 via MHL A/V link -- and of course, that Guinness Book of World Records certification as the first mobile phone to run on a dual core processor. Remember that we are just comparing technical specs here and not the actual performance of both phones. So, for example, when we say that Samsung Galaxy S2 is more powerful than LG Optimus 2X, it means that on paper Samsung Galaxy S2 has better technical specifications. Note that TechPinas has yet to test, review and compare units of both models to see how well they actually perform individually and in comparison to each other. So off hand, which phone are you more likely to get? The thinner and more powerful Samsung Galaxy S2 or the cheaper Guinnness-title-holder LG Optimus 2X? Do you think their specs differences are that relevant? samsung galaxy s2 of course!!. performance wise, i'd choose optimux 2x because of its tegra 2 chipset. but for battery life, SGS 2 is still better, with energy sipping super amoled LCD and 1650mah battery. its LG,,the 3D interface is superb. San po available ang SGS2? will have exclusive rights to sell the handset for a limited time. I like Optimus 2X's front touch panels but still Samsung for me.